50 buildings, 250 residential units. reception, convenience store, kiosk, bar. backyard. fee payable: WLAN Hot-Spot, WLAN in reception area, WLAN in restaurant area, WLAN in pool area, bakery service. with modern furnishings. on ground floor or upstairs. kitchenette. gas stove with oven, refrigerator with freezer, coffeemaker, eating nook. shower, bidet, toilet. TV. air conditioning (cold/warm). washing machine. balcony or shared backyard. outdoor furniture, parasol. 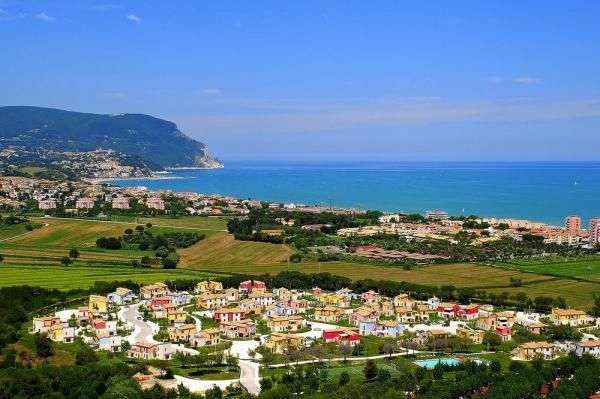 parking space in 30 m.
bakery 1 km, shopping 1 km, shopping mall 15 km, bar 300 m, café 300 m, restaurant 300 m, sea, sandy/gravel beach 300 m, airport Ancona 34 km, location Marcelli 3 km, location Numana 5 km, location Sirolo 6 km, location Ancona 25 km, wellness oasis 4 km. For hygienical reasons a bathing cap must be worn when entering the pool. playground, Kids Club geöffnet von the beginn June bis in the mid September. baby crib (in addition to maximum occupancy), baby tub, please reserve. entertainment (seasonal), soccer, multi-use sports field, tennis. bicycle rental (fee payable).